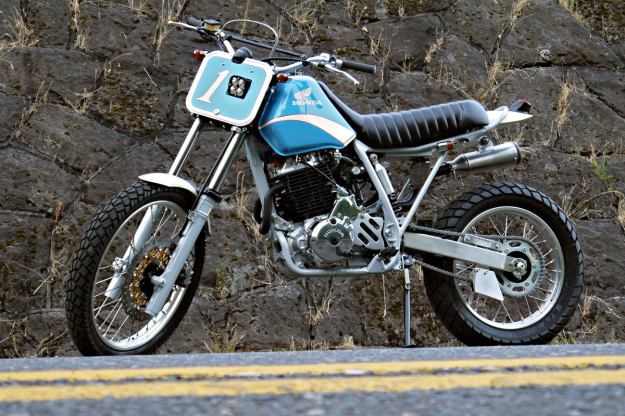 The Honda XR650L is one of those big, bulletproof dual sport bikes that never seem to change. It’s tough and simple to fix, just like its evergreen competitors—the Suzuki DR650 and the Kawasaki KLR650. 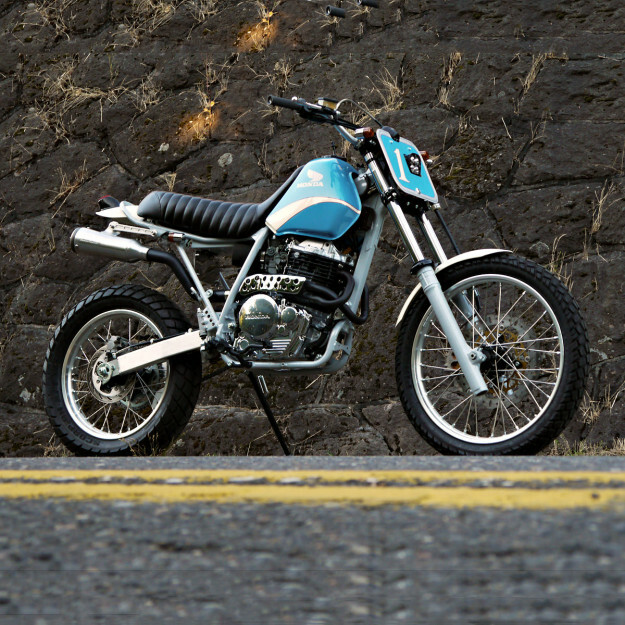 With a 21-inch front wheel and a 37-inch seat height, the XR650L is not exactly custom-friendly. So this retro-inspired revamp from Joe Tessitore of Digital Directiv caught my eye. “I’m not a big fan of commissioned builds,” says Joe, “but every once in a while someone proposes a project that sounds like fun. That was this bike.” It started life as a 2007-model XR650L, minus the generic red bodywork: the owner had pulled off the plastic in an attempt to find cleaner lines. Joe replaced the ugly asymmetrical subframe rails with fresh, straight tubes and gussets to give an open and clean rear triangle. At the same time, he added a kicked-up hoop to support the abbreviated rear fender. The rest of the frame was smoothed and de-tabbed and under the seat is a custom-fabricated battery box, replacing the big plastic factory unit. 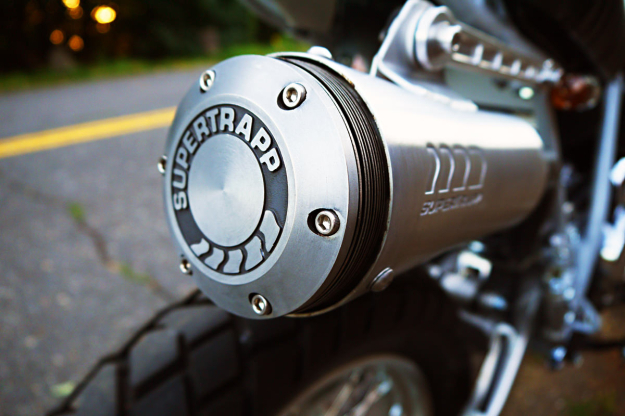 The refinished engine stays with the vintage theme, thanks to a healthy dose of polished aluminum. 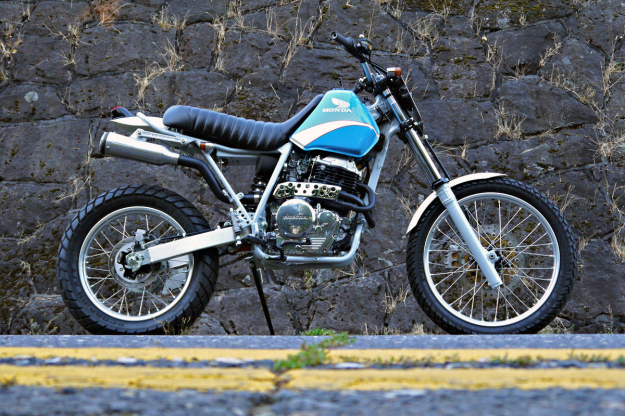 This XR650L lives mainly on the street, so the long and somewhat sloppy suspension travel wasn’t good enough. To tighten things up, Joe has braced the forks, lowered the ride height an inch and a half, and fitted Progressive Suspension springs. New wheels help the handling too: aluminum rims laced with stainless spokes from Buchannan’s and hooked up to freshly powdercoated hubs. The tires are Pirelli Scorpions. 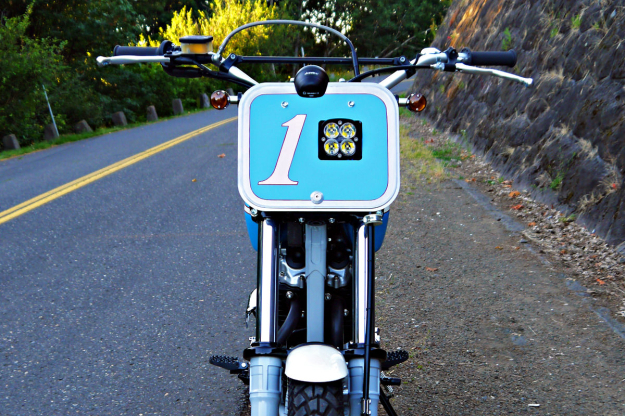 Tony’s Customs and New Church Moto came through with vintage-styled paint and upholstery. 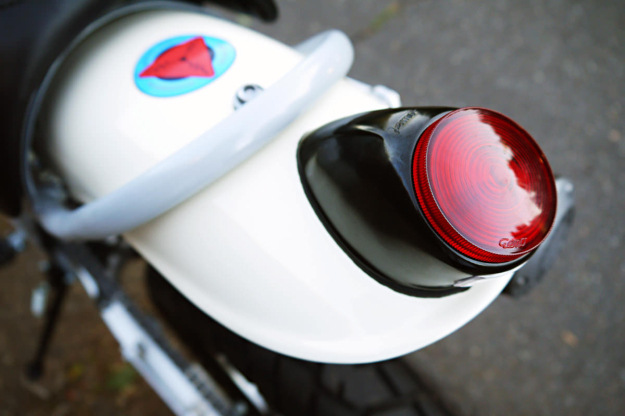 And small but important details helped to complete the look, like CNC brackets from Motofactory and a reproduction Bultaco taillight from Spain. Get in touch with Joe via the Digital Directiv website. And if you need any advice on electrical matters, check out his brilliant article on How To Wire Your Motorcycle.